Use fuel stabilizer on your final fill-up: If you are in need of some more gasoline this season to run your outdoor yard tools, then we would recommend adding fuel stabilizer to the gasoline. This additive will help keep the fuel good for up to 2 years! Or for an even easier solution, you might want to consider a product such as TruFuel, which has zero ethanol and totally eliminates the problems caused by traditional gasoline you would by at the gas station. Adding fuel stabilizer or using TruFuel, will help ensure that any gasoline you have around at the end of the season is still good to use early next year. 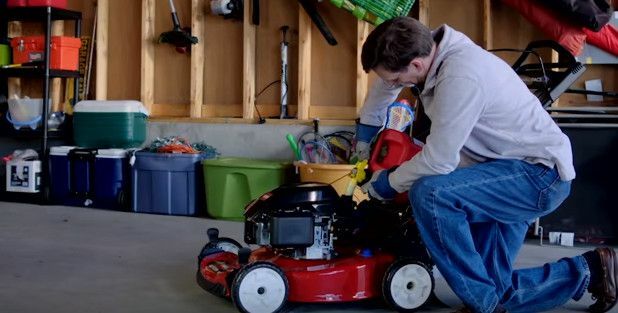 Run mower dry of gasoline: This is the most critical step in storing your mower for the winter, and there are two ways to do so. The easiest way is to start your mower as you typically would and allow it to run dry and stall out. You will then want to start it up one more time, and let that last little bit run to stall out a second time (if possible). The mower should be sufficiently dry to store at this point. The other option (depending on your lawn mower model) is to use the drain plug that is located on the carburetor bowl. You may drain the entire gas tank (and carburetor) free of gasoline by loosening this screw and draining it into a bowl of some sort for safe disposal. If you use straight gasoline in your mower, you can now pour this gasoline into your car’s fuel tank as to not be wasteful. Adding oil to the engine to lubricate pistons: This is performed by removing the spark plug and adding about 1 oz of oil to the engine. After the oil is dropped into the engine, you will pull the cord a few times (with spark plug disconnected) so that the pistons are lubricated evenly. Please reference your mower’s owners manual if you are unsure whether this procedure is recommended for your particular mower. Charge battery (for electric start or cordless mowers only): Not charging your battery before the winter can cause the battery to drain too low and fail the following year. For gasoline models with an electric start battery, you will want to charge the battery for a full 24 hours before storing. If stored in a unheated room or garage, you will want to recharge every 3 months. If storing a cordless mower, then you will want to charge the battery fully now and periodically throughout the winter. If the batteries are removable, then give them a full charge and bring the battery inside so that it is not harmed in any way. This would be the same situation for any other cordless yard tools, such as cordless blowers, string trimmers, hedge shears, and grass clippers.